So you'd be ready to flaunt them for your more intimate moments, too. Paying attention to your body's details is the key to becoming more attractive and ~desirable~. That said, there are certain parts of the body that require more than just a good scrub. These parts may be a bit more sensitive and intimate than the rest, which is why you should treat them with extra special care. The back of your neck is not something that you regularly check, but it's visible to other people. If your nape has gotten dark, it can be a major turnoff, right? The discoloration can occur for a number of reasons. Fancy jewelry, for one, can cause skin darkening on your nape and around your neck. Sunburn, dry skin, clothing friction, and weight gain may also lead to hyperpigmented skin. There are supposed home remedies—oats, cucumber, baking soda, yogurt—that you can use to brighten the affected areas, but these could result in skin irritation if not applied correctly. However, creams or lotions containing kojic acid, tretinoin, or hydroquinone (among others) can prove effective as brightening agents. Do you sometimes feel conscious about wearing shorts because of your inner thighs? Thighs rubbing against each other can be a problem, since it leads to skin abrasion and, eventually, darkening. Get your natural skin color back by using remedies that can be taken directly from your kitchen or garden. Pure aloe vera, for example, can serve as a great gel not only to brighten the skin but also to soothe the abrasion. Natural yogurt is another good option, thanks to its lactic acid content. If you'd rather not take a risk with DIY home remedies, you can opt for over-the-counter products like creams and lotions instead. The underarm remains to be one of the most common problem areas for ladies, because of chicken skin, redness, roughness, sweat and odor, and darkening, to name a few. They arise due to some degree of negligence and poor hygiene. Not only do these underarm issues restrict your movement, they can also be symptoms of skin conditions that can worsen if not addressed ASAP. With all the beauty-related information you can find online, it's not hard to come up with a skincare regimen for your underarms. If we can commit to a 10-step regimen for our faces, why not do the same for our underarms, right? It doesn't have to be that tedious. With a product like Belo Beauty Deo, a few swipes is all it takes. 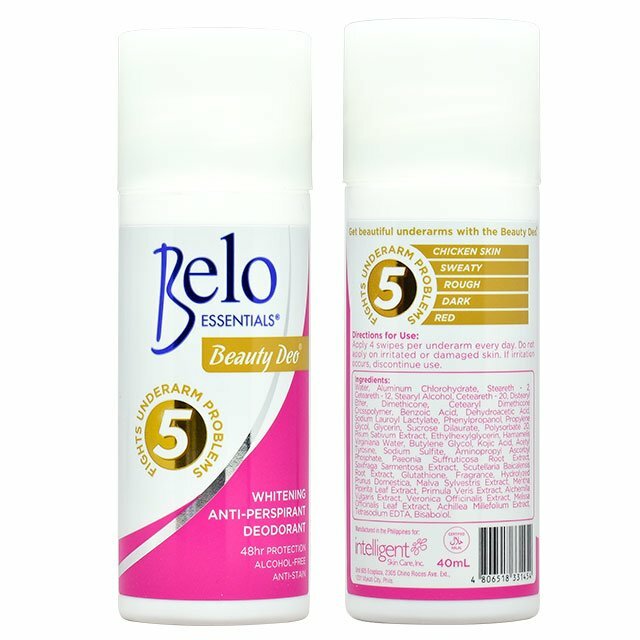 With regular use, Belo Beauty Deo helps you achieve brighter, smoother, and kissably beautiful underarms, so there's no need to shy away from a sexier, more confident you!